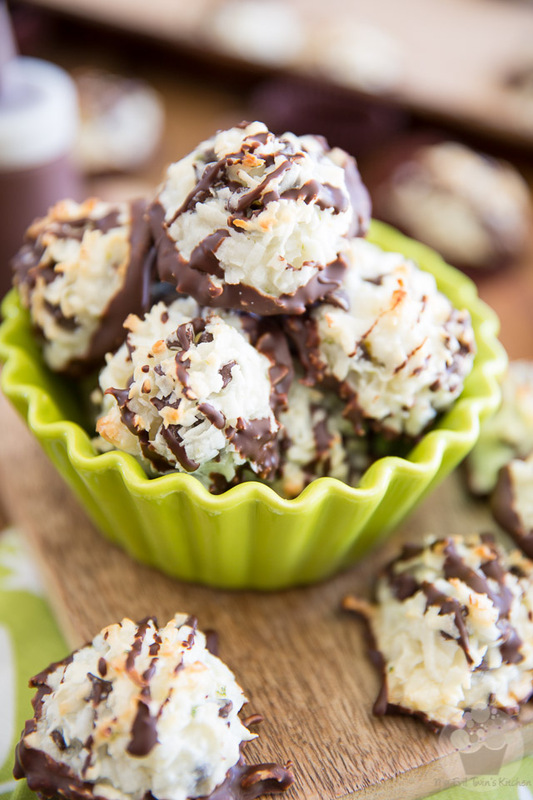 I love me a good coconut macaroon from time to time. When the craving strikes, though, I’d much rather make my own at home than buy the ready made cookies that they sell at my local grocery store. 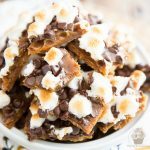 For starters, they’re super easy to make, and they are SO much better than the store-bought stuff. Plus, you get to add all kinds of yummies to them when you make your own. 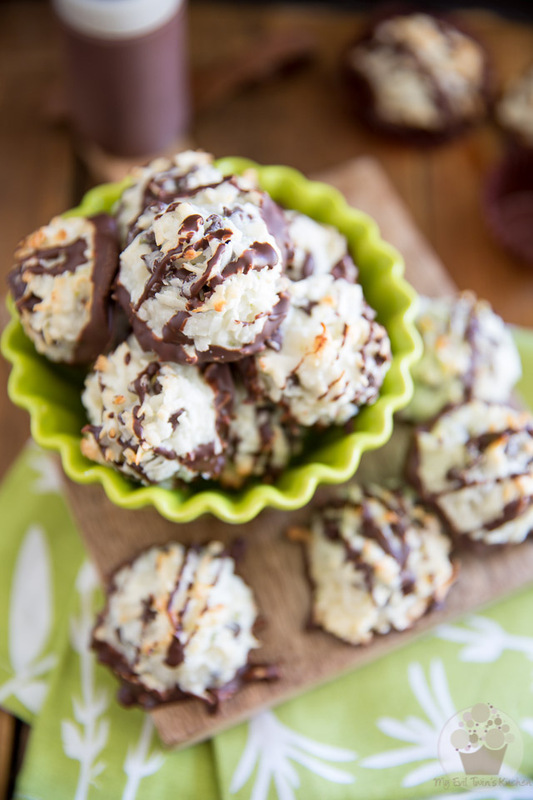 Just like I did with these Dark Chocolate Coconut Macaroons. Not only did I add mini chocolate chips to them AND gave them a delicious chocolate base and topping, but I also threw in a little bit of lime zest and juice, to give them a little bit of a tang. If you’ve never tried the dark chocolate / lime combo, you totally have to remedy that. 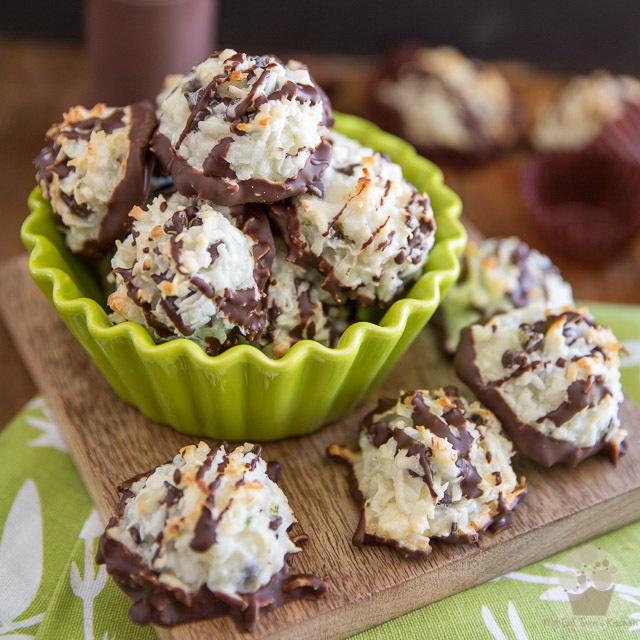 These macaroons, they’re super dense, chewy and sticky, just the way I like ’em, and they totally explode with the most deliciously sweet and tangy coconut chocolate lime flavor. Seriously. You won’t believe the amount of flavor that such tiny little bites harbor under their hood. 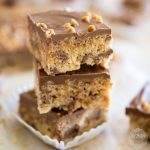 In short they are so deliciously addictive, you’ll never be able to stop at one… Either you make them for yourself, as a hostess gift or to contribute to a social gathering of some kind, I guarantee you that you can’t go wrong with these guys. 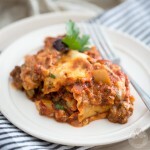 Everyone will be asking for the recipe; good thing is, you’ll be able to give it to them! 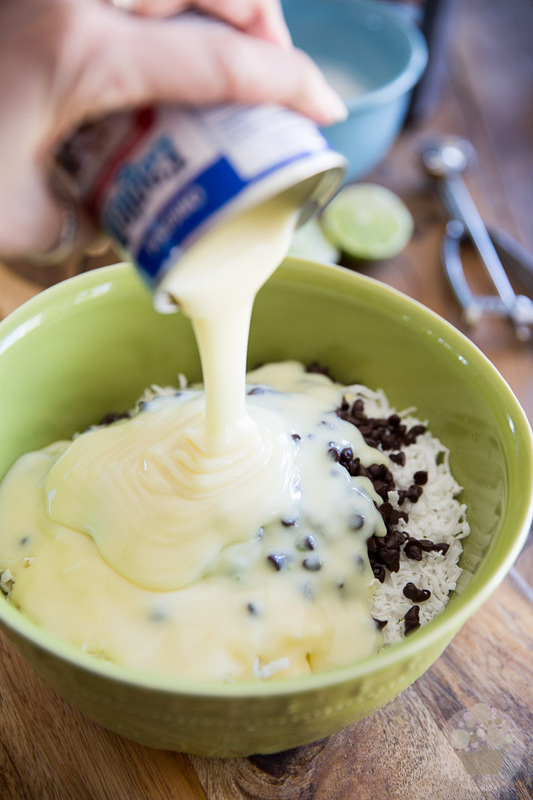 To start, combine the sweetened shredded coconut, chocolate chips, sweetened condensed milk, lime zest and juice, corn syrup and salt in a large mixing bowl. Now wait a minute… I can’t possibly be pouring sweetened condensed milk without taking pictures now, can I? I must admit that I may have a small problem with this ooey, gooey, sticky nectar… I can’t get enough of watching it rippling down in cascades like that, so I can never resist photographing the pouring action. There’s just something about that stuff that makes me drool so bad, I could very well sit myself down with a can and eat the whole thing by the spoonful. 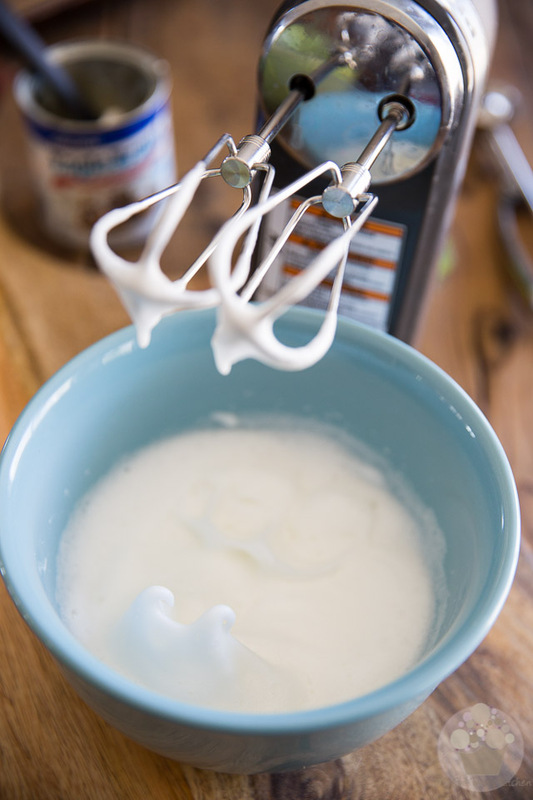 Carefully fold the egg whites into the reserved coconut mixture. 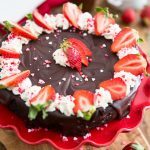 Be sure not to over-mix here — you wouldn’t want to lose all the precious air that you just incorporated into those egg whites. As soon as the whites are completely mixed in, stop. 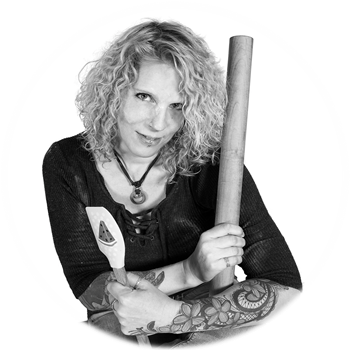 Now drop the macaroon batter by the tablespoonful onto a 13″ x 18″ baking sheet lined with parchment paper or better yet, a silicone mat. The use of a small spring-loaded cookie scoop is strongly recommended. Not only will it make your job so much easier, it will also give the cookies a pretty little domed shape, and will also ensure that they are all fairly evenly sized! 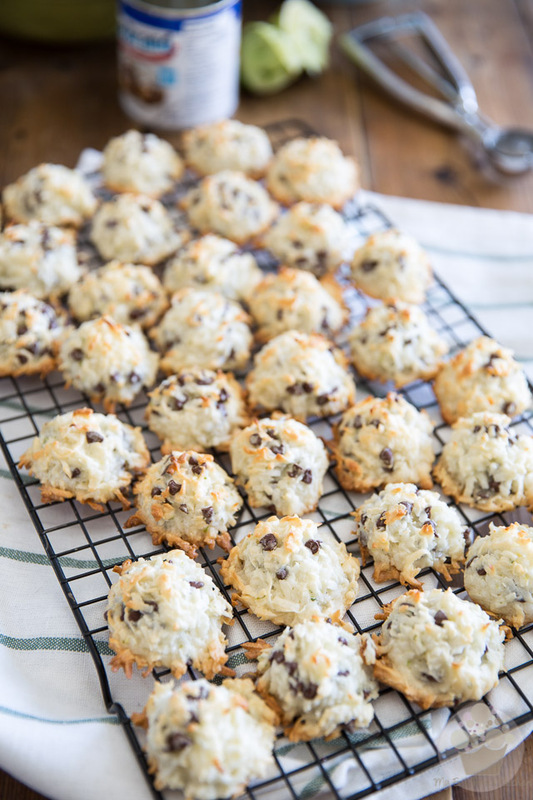 Bake the macaroons in the preheated oven for 20 minutes or until just barely golden on the edges. 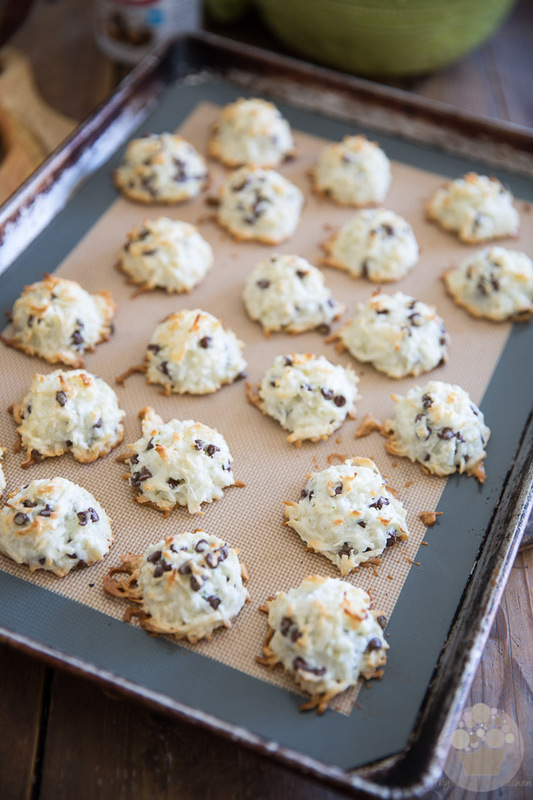 Make sure not to over-bake your macaroons, otherwise they will end up dry and kind of hard, as opposed to soft and chewy… Don’t wait until they turn completely golden: they should only be slightly brown around the edges and on the very tops. 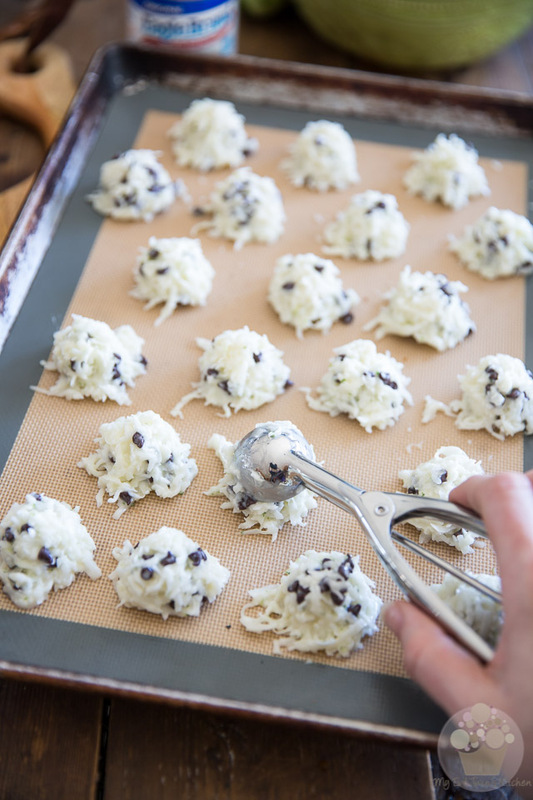 Allow the baked coconut bites to cool in the pan for a few minutes and then transfer them to a cooling rack to cool completely. Bake the remaining macaroons and cool those completely as well. 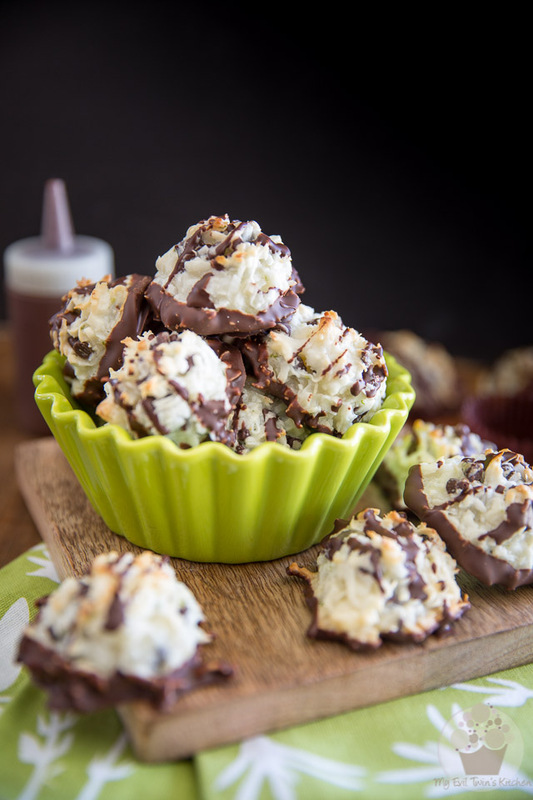 When the cookies are nice and cool, melt the chocolate and coconut oil together in the microwave in 30 seconds increments, stirring well between each increment, until the chocolate is completely melted but not hot to the touch. It should feel barely warmer than body temperature. 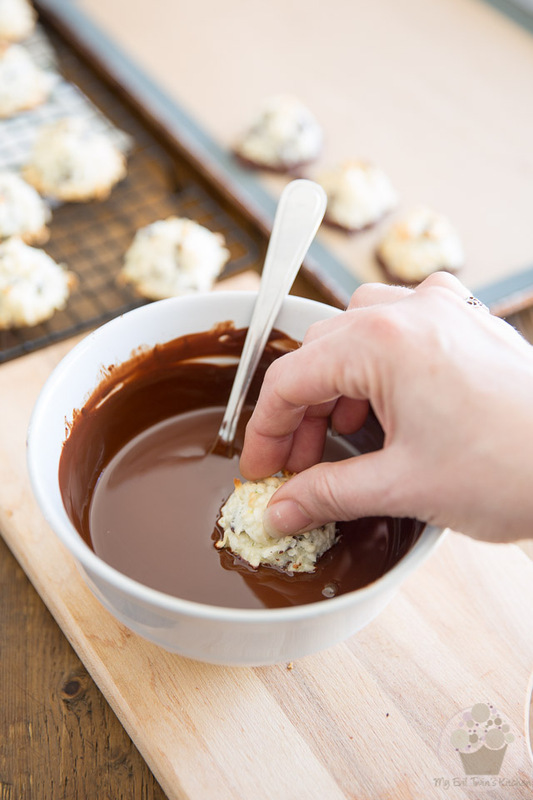 Dip just the bottom of the macaroons into the chocolate, let the excess drip for a few seconds and then place them back onto the baking sheet to set and dry, either on parchment paper or silicon mat. Transfer the rest of the melted chocolate into a squeeze bottle and drizzle a little bit over the tops of each macaroon. Garnish with additional lime zest, if desired. Unfortunately, I didn’t have any lime zest left, so that’s why I didn’t do it. 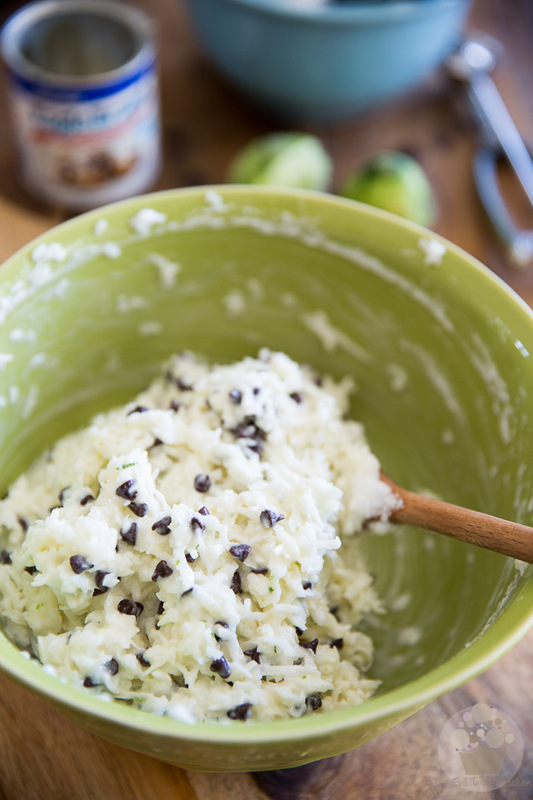 Trust me, it’s not that I had no desire to… In fact, I strongly suggest that you do it: not only will it add a nice touch of green to your cookies, it will make the touch of lime just that much stronger. Trust me, that can’t be a bad thing. Once again, dark chocolate and lime is a totally winning combination! Store your finished macaroons in an airtight container, in a cool dry place, for up to a week. 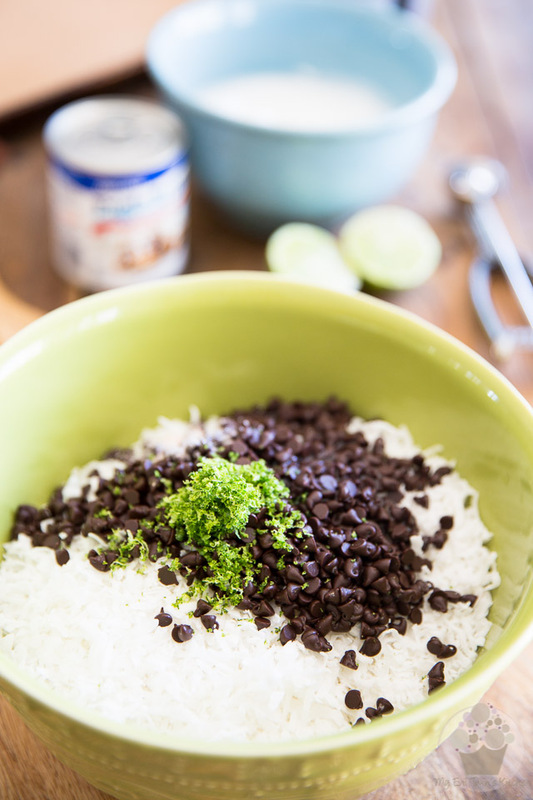 Combine the shredded coconut, chocolate chips, sweetened condensed milk, lime zest and juice, corn syrup and salt in a large mixing bowl. Mix well and set aside. 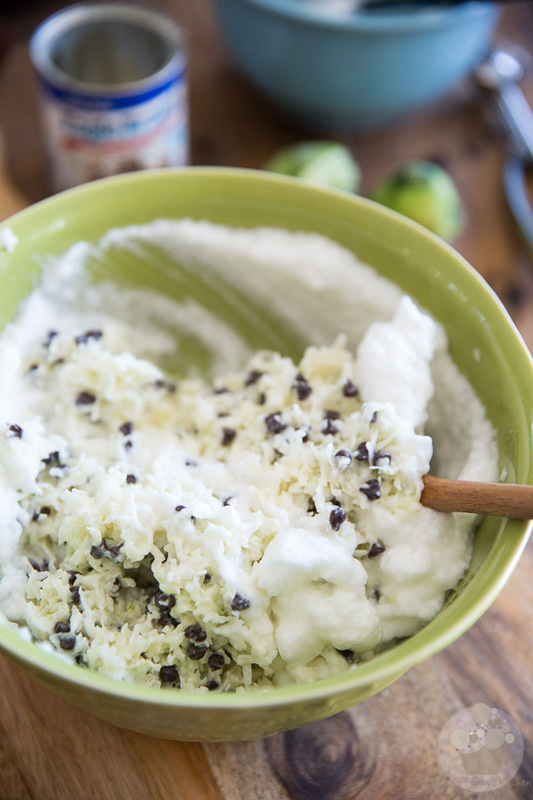 Beat the egg whites to soft peak with a hand held mixer on high speed; carefully fold the egg whites into the reserved coconut mixture. Drop the macaroon batter by the tablespoonful onto a 13" x 18" baking sheet lined with parchment paper or better yet, a silicone mat. The use of a small spring-loaded cookie scoop is strongly recommended. Bake for 20 minutes or until just barely golden on the edges. Allow to cool on the pan for a few minutes then transfer to a cooling rack to cool completely. Bake the remaining macaroons and cool completely. When the cookies are cool, melt the chocolate and coconut oil in the microwave in 30 seconds increments, stirring well between each increment, until the chocolate is completely melted but not hot to the touch. It should feel barely warmer than body temperature. 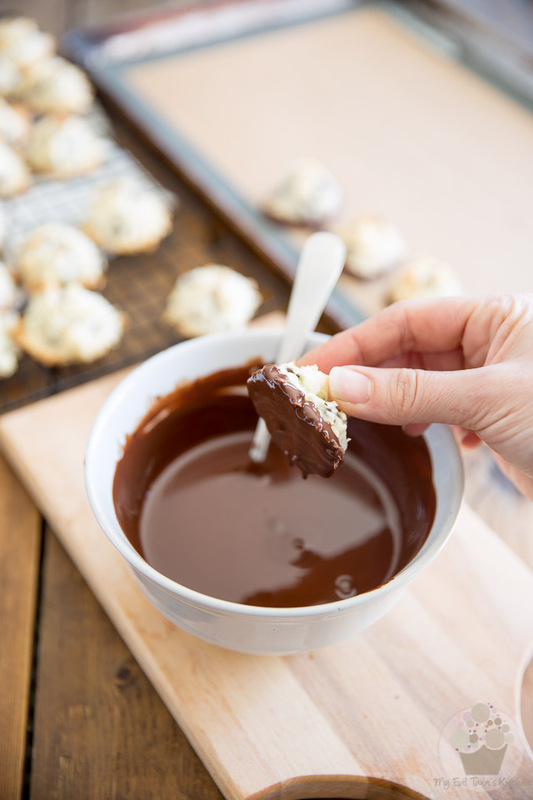 Dip the bottom of the macaroons into the chocolate, let the excess drip for a few seconds and then place them back in the baking sheet, either on parchment paper or silicon mat to set. 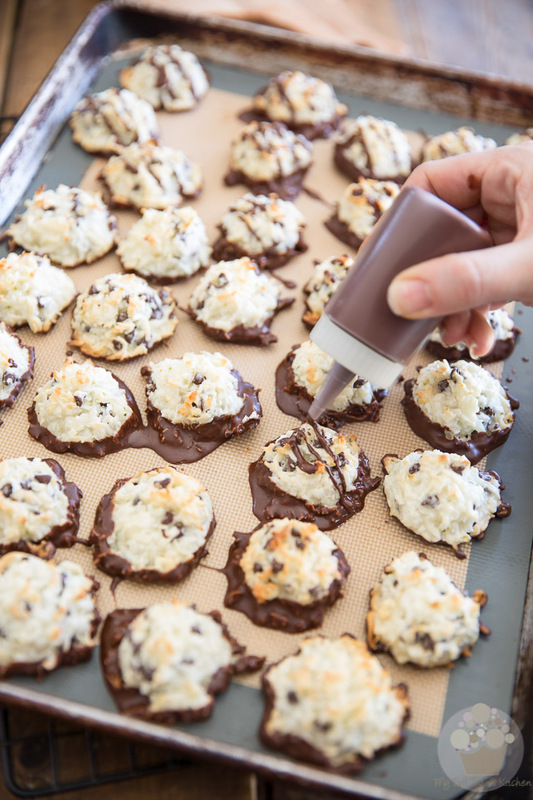 Transfer the rest of the chocolate into a squeeze bottle and drizzle a little bit over the tops of the macaroons. Garnish with additional lime zest, if desired. Store in an airtight container in a cool dry place for up to a week.